Charles Thomas Woolgar, was my great, great grandfather. Born 1837 at Horsted Keynes, he lived much of his life in and around Hove. Charles was a larger than life figure, well known in the George Street area of Hove. I am told he dressed ‘like a gentleman’ and would parade up and down with his walking stick – or should I say cane? He certainly lived in George Street from 1896 to 1903. All I originally knew about him was from family stories – tales of him being mean and treating his wife badly. I am told he gave his children money to go bed and be good, only to demand it back in the morning as payment for breakfast! He terrified my mother by sitting in the family florist shop, waving his stick about, shouting at customers. The shop was in Church Road, Hove; variously known as ‘T Banks’, ‘Banks and Son’ and lastly ‘Banks of Hove’. Other family stories were of his being the illegitimate son of the Prince of Wales, later Edward VII but either they were spread to bolster his image or the teller was confused. I also heard about him owning a bathing machine business and that his son inherited this but sold it on to an employee called Morley. Born to a seemingly, very normal family, his father being one of the eponymous ‘Ag Labs’, Charles Thomas grew up in a fairly rural district but times were changing and people were still moving to the bigger towns and cities. Sussex was a poor county in the 1800’s. 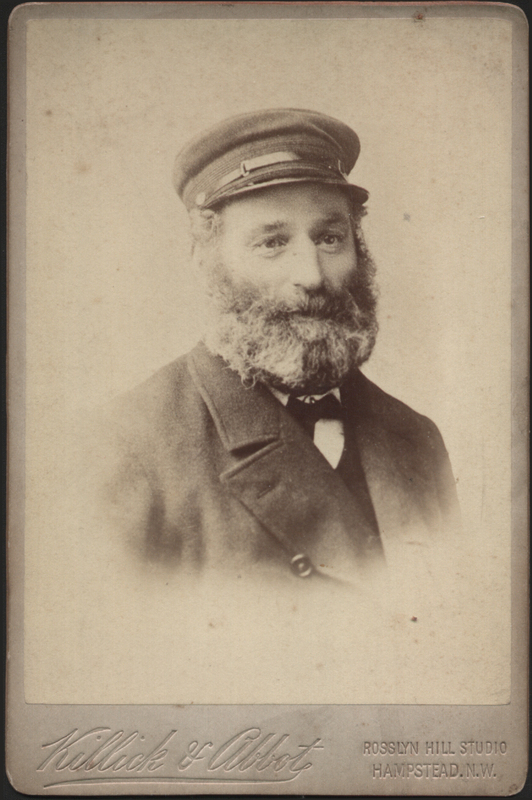 By 1861 Charles had left home, married and joined the Merchant Navy – he is “On Board Vessel ‘Spring’ Shoreham Harbour aged 24 a sailor”. When I first found out he was a sailor, I pictured him going off to foreign shores but the only evidence of his service found, so far, is that census entry and other references to his occupation. Perhaps I do him a dis-service but the fact he was no further away than Shoreham Harbour. The family lived in Portslade and Southwick for a time before returning to Hove. At least eight children were born between 1861 and 1880. He doesn’t seem to have lived with wife Harriet much after the 1880s. By 1901 she was in Steyning Union Workhouse, listed as a pauper; even though Charles was very much alive. Harriet died in the workhouse in 1913. Charles is shown in records, as a bathing machine operator and later as a pleasure boatman. I know his son, Harry, was later involved with the ‘Skylark’. Charles Thomas remarried in 1917, to a wealthy widow called Rebecca Hammond. From what I have been told, he and Rebecca lived a very good life in London where Rebecca owned Bakery shops. Apparently Charles used to model for artists who made stained glass windows and was used to represent prophets and saints! With his beard and strong face he probably did look like someone from the Old Testament. Charles lived to a ripe old age and died in Bloomsbury in 1923. His widow renounced any claim to his estate, valued at £71.15.0d, in favour of his son, Henry Woolgar Unfortunately there is no further detail to say whether the Estate consisted of anything more material – like a Bathing Machine. My great-grandfather was a Woolgar, who had a daughter called Winefred Rose, who was my grandmother who later became Juden. I remember my Great-grandfather telling me stories of the great war in the late fifties early sixties. I wonder if he could be one of the children of your Great,great-grandfather. I will have to do a bit of research to find out if there could be a link. There was a ‘Mr Woolgar’ who worked behind the counter or a shop in Western Road in the early 1950s. I don’t know whether this was Sainsburys, the Holes and Davigdor dairy or wherever but it was somewhere near Brunswick Place. I wonder if this Mr Woolgar was related to Charles’ family? My grandfather was Frederick William Woolgar. He died in 1948, the year before my birth and I have limited information about him. I know that he was born around 1870 in the Shoreham area and that he too was a merchant seaman who sailed out from Shoreham. He moved to London where my father was born. He married Mary Anne Denney, (my grandmother) and had 6 children. Thanks to all who have left comments on this page. I have done a lot more research on Charles Thomas and his family, including his wife Harriett, and I will post some of it soon. If Robert Woolgar, or anyone else, would like help to trace their family, or just to contact me about this page, then please email me at Natbrent@fastmail.fm. I will be happy to try and help but do please bear with me as I have health problems and may not be able to reply straight away. I hope to submit information concerning Robert Woolgar’s ancestors shortly – helped greatly by another researcher. I am awaiting permission to include that information. My mother-in-law is from Southampton but her family were from the Brambling / Steyning areas previously. From her family tree, two of her male Blann ancestors married Woolgars. I believe one was a Frances Woolgar. Any connection to your Woolgar family I wonder? This is a very belated reply to the comment left by Lisa Rust. Apologies for the delay but I’ve had a difficult year. I know there was a major branch of the Woolgar/Woolger clan in the Steyning/Bramber area and believe there is a link but have not been able to establish it, or rule it out, as yet. Marion Woolgar is the goddess of Woolgar/Woolger research and has lots of information about your line and there is quite a bit available on-line. I can put you in touch with Marion if you like. Let me know an email contact if you would like to know more. Thanks for the message. My email is: Natbrent@fastmail.fm but please bear with me as I can be a bit slow responding due to health. I’m a girl called Robbie Woolgar named after my grandfather, Robert Woolgar. He had a brother called Charles Woolgar. And a famous actor from the 70s, Jack Woolgar, is also a distant relative to me – my dad’s great great uncle I think.